I couldn't agree more with this quote. I like to experiment with fashion. Why not? I once worked in a showroom for an amazing furniture manufacturer. It was a modern furniture company and they were fine with us dressing a little more fashion forward. One day I wore a super ruffly dress in a bright color (with a blazer) and one of my fave clients came in. He said to me "wow, that's quite the dress. It kind of looks like something my daughter would wear to school...on wacky wednesday...she's in kindergarten". I laughed out loud. While my co-workers seemed to look on in horror, I was smiling from ear to ear. I liked the fact that I was dressing a bit crazy, dressing just the way I wanted. 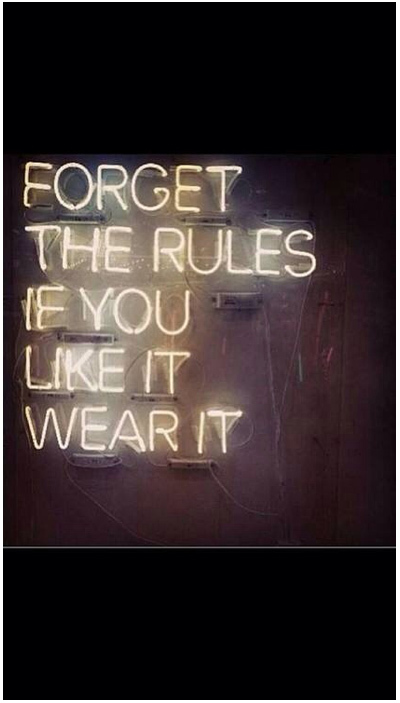 So I completely agree, "forget the rules, if you like it, wear it"!